Dietary Fiber and its Health Benefits – Sense of Urgency! The importance of fiber in the diet cannot be overemphasized. Dietary fiber—what we used to call “roughage” or “bulk”—can help prevent or alleviate chronic constipation, hemorrhoids, diverticulosis, IBS, and possibly colorectal cancer. There is some early evidence suggesting that a high-fiber diet may lessen or prevent food allergies, and dietary fiber also appears to have health benefits outside of the gastrointestinal tract—for example, it may help lower cholesterol levels, and prevent obesity, heart disease, diabetes, and certain types of cancer. Fiber is found in plant foods, such as grains, vegetables, and fruits. There are two types: insoluble and soluble. Insoluble fiber is not digested—instead, it adds bulk to the stool, enabling it to pass more rapidly through the digestive system. Sources of insoluble fiber include wheat bran, whole grains and wholegrain products, and the tough parts of fruits and vegetables that take longer to chew, like the skins of apples, cucumbers, and grapes. Soluble fiber attracts water as it passes through the digestive system, resulting in soft stool that is easier to pass. 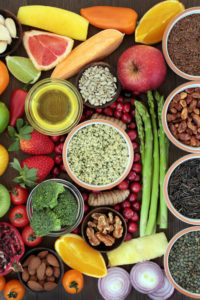 Soluble fiber is found in beans, fruit, oats/oat bran, nuts, seeds, and many vegetables, including Brussels sprouts, sweet potatoes, and asparagus, among others. It also can be taken in capsule form as psyllium. If you’re planning to increase the amount of dietary fiber in your diet, it’s best to do so slowly. Soluble fiber has the potential to produce gas, so you may notice more gas or bloating when you suddenly increase your fiber intake. However, if you add fiber slowly over time, your gastrointestinal tract will adjust. In addition, as you increase fiber, it’s important to drink more fluids (water, soup, broth, juices). Try to drink eight glasses of liquid a day. To learn more about ways to improve your digestion, purchase Digestive Diseases & Disorders from www.UniversityHealthNews.com. The post Dietary Fiber and its Health Benefits appeared first on University Health News.